The Imgurians among you will have received an alert about the 50th anniversary of Star Trek the original series last Thursday on 8 September. Following the alert linked to a million-and-one Star Trek images, gifs, and posts from every series to the movies. 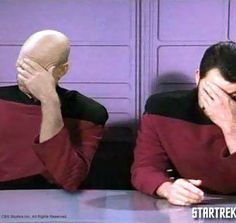 Fans recalled their favourite moments in the iconic show's history from the Picard and Riker's double facepalm to the racy first-ever televised interracial kiss. Imgur wasn't the only one to pay homage, the United States Postal Service (USPS) released a special quartet of stamps showcasing memorable silhouettes from the original series including a silhouette of someone getting beamed aboard, the Starfleet insignia, the Vulcan greeting, and the USS Enterprise otherwise known as the Starship Enterprise. Star Trek themed stamps have been made only once before in 1999 as a part of their "Celebrate the Century" stamp release. This speaks to how influential and monumental the TV show was in the 20th century. In its 3 year occupation of America's television sets, Star Trek challenged norms by targeting sexism/feminism, racism, and militarism/peace. Watching the show today will shed some light on 1960's America and its many faults. It addressed key societal issues in a way that nothing at the time would. In answer to sexism, Number One, a nameless female lead in the pilot script, had knowledge that surpassed the captain. She was so valuable that she had to be left aboard the ship while the team went on risky away missions. Unfortunately, she was cut from the script on the request of NBC executives because "a woman in such a powerful authority position on board a starship" was not identifiable, according to Leonard Nimoy in behind-the-scenes footage. Lt. Uhura takes the next best option as fourth in command aboard the ship. 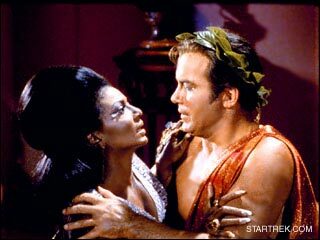 Not only is she given power and depended on for knowledge, Uhura is a strong character who can ably take care of herself. Speaking of Uhura takes us to our second point: Star Trek's answer to racism. The Enterprise crew in each series has been a delightful mix of races and species. Placing minority races in key crew positions demonstrated a conscious step towards improved racial relations. A Japanese-American, Lt. Sulu played by George Takei, was an irreplaceable helmsman, and an East-African princess, Lt. Uhura played by Nichelle Nichols, was a vital communications officer. While neither character consistently shocked with unexpected lines, actions, or scenes, their inclusion served as an example and reminder of equality. One episode in particular, "Let That Be Your Last Battlefield," takes a pointed stance against racism. 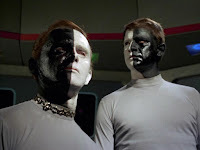 In the episode, a race of people are literally divided in halves, black and white. From the planet Cheron, Bele (left) and Lokai (right), though they look remarkably similar, are struggling with racial bias. If you examine the picture closely, you'll see that Bele is white on the left side of his face and black on the right. Lokai's colouring is the opposite and for this he is considered inferior to Bele. Aside from lecturing on racial differences and equal but separate treatment, the underlying theme is hatred. In the end, the entire race residing on Cheron is dead from a race war. When Bele and Lokai see the desolation they follow in the footsteps of their brethren, beaming down to the blood-soaked planet to continue their feud. In answer to topics of war and peace, Star Trek has not been quiet in its criticism of violence, war, and threats. The original series was running during the Vietnam war and so took opportunities to mirror major issues, as in the episode "A Private Little War." Many of the episodes, especially those with warring powers, show peaceful negotiations and non-violent ways to solve controversies. The Klingons and Romulans offered a great opportunity for writers to play out different scenarios. These points are expanded upon in J. William Snyder Jr.'s Star Trek: A Phenomenon and Social Statement on the 1960's. How special is it to witness defiance and historical relevance in a TV show, one that represents the quintessential nerd? With 7 television shows (Discovery is set to release 2017), 13 movies, books, comics, games, and tons of merchandise, Star Trek's 50 year anniversary is a happy day for us all. For me, Star Trek has a permanent place in my heart ... The Next Generation, anyway. If I'm being honest, not just TNG, but Deep Space Nine and the movie reboots aren't bad. There's so much to love! Happy times like these are when you wish that Facebook would just give the world what it wants. In this scenario, what would that look like? I'm glad you asked! Below you'll see Facebook's tribute to the entirety of Star Trek. For the anniversary, they've replaced standard reaction buttons with Star Trek themed variants. For a limited time, some Facebook users in the U.S. and Canada were able to take advantage of these classic images. 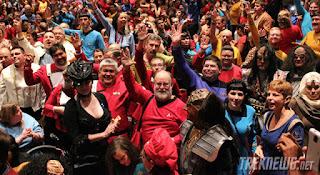 Added to reactions are the Vulcan salute (Live long and prosper), a jovial Captain Kirk, an awed Spock, a sad Geordi La Forge, and an angry Klingon. 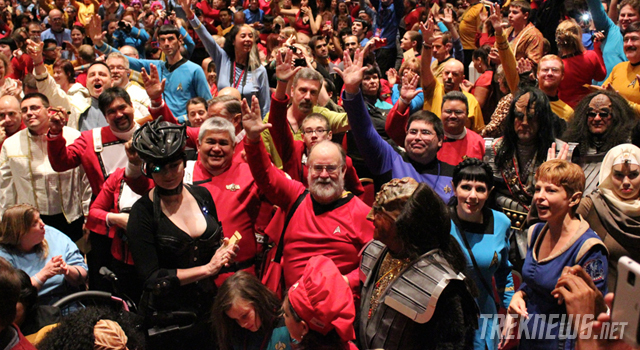 Facebook Celebrates Star Trek's 50th from Facebook on Vimeo. Not everyone has done enough to commemorate the glorious anniversary, including the television network that hosted the original series. To some, CBS has royally screwed up the anniversary.